Dunbar - Bridges typically connect two landmasses from the water surface. But in Scotland, there is a bridge in the middle of the sea named Bridge to Nowhere, not clear what it means. The town of Dunbar, 45 km from Edinburgh in Scotland has a unique bridge of interest, its name is Bridge to Nowhere. This bridge is in the middle of Water Biel in Belhaven Bay, as collected detikTravel from various sources, Tuesday (22/05/2018). Located in Biel Village, south of Dunbar City, Scotland. The bridge has a very nice water and skyline to photograph. Apparently the mystery of this bridge was solved when the water in Water Biel began to recede. This bridge seems to be the coastal link of a small river that flows under the bridge. When the sea returns, the steps of the bridge will disappear. 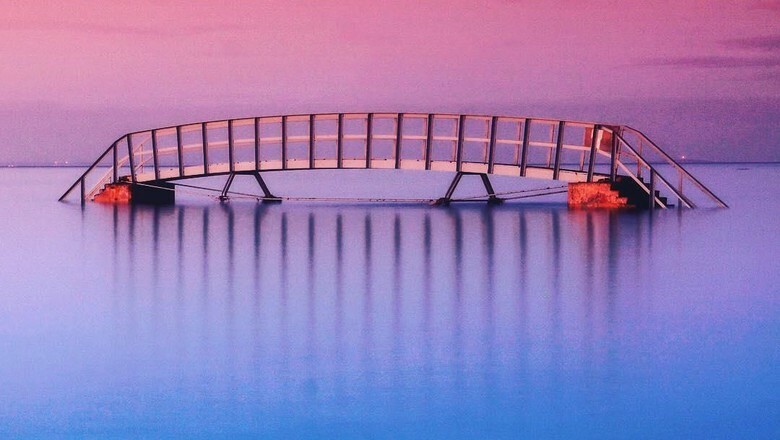 This makes this gorgeous bridge look like it was stranded in the middle of the ocean. That's why this bridge is named Bridge to Nowhere. At dusk, the water will begin to tide and there is no activity on the bridge. But on the edge of the water there will be many people who come just to photograph the beauty of this bridge at dusk. 0 Response to "Bridge to Nowhere in Scotland"